Personal and professional development is a big issue in the psychotherapy world. My professional organisations (BACP: UKCP: UPCA) all demand that I engage in the stuff called ‘continuing professional development’ with the personal bit assumed to be somehow incorporated or concomitant. However, having written a book on this subject I think I am on firm ground when I say the definitions of development are somewhat sloppy. Is change the same as development? I’m thinking about this now for two main reasons. The major push comes from agreeing to write a book chapter on the subject. Out of the fog of procrastination, some embryonic thoughts are emerging. The other impetus comes from having moved from the Midlands to the South West. The change in environment and circumstance has had a big impact on me ‘personally’ – but have I ‘developed’? I think I have been freed up to experience what is around me in a new way. Of course it is unfamiliar and exciting, and perhaps in time it will all become taken for granted – but I don’t think so. It reminds me of holidays in beautiful places, where you get up every morning and are bowled over by the view; but now there is no going home – I live here! Unlike a holiday I now have the opportunity to appreciate a beautiful physical environment over a long period of time. Right now this is still difficult to grasp, whilst at the same time I feel I have a significant relationship with the place already. Our relationship with place is something that I have been exploring here in the blog before. I see now that my proclamation of love for the boatyard was just a foretaste of what was to come. With this positive and very visceral relationship with the physical environment I feel that I am moving into new territory. If this had been an outcome of therapy, I’d call it a great success. A great success but also a great challenge. The moving process itself was riddled with anxiety and shock, and despite the enormous gains there were many losses. It challenged me in all sorts of ways, and that, I am sure, has got to be a part of the process of development. It has to be more than reading the book and doing the ‘self reflection exercises’ that are now in every psychotherapy book I come across! In just the same way my sketching is unlikely to develop without something toppling me off of the current plateau and making me struggle. 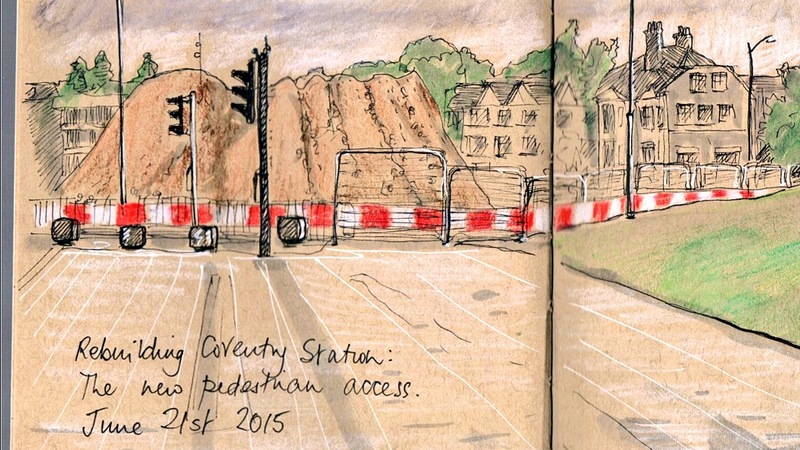 It’s taken a while to get it going again after moving house, but it’s back on track – a track that will probably be ploughed up in the summer when I attend the Urban Sketchers international symposium in Manchester. Tickets sold out within 4 minutes of going online, so even the process of booking was a challenge. I’m thinking that the workshops will demand far more, shaking me free from my comfort zones but holding out the possibility of seeing more of the world than I can at present. There is, it seems to me, no way of avoiding feeling useless, confused, upset, de-skilled, off balance – if any new personal learning is to take place. I think this should be part of the definition! 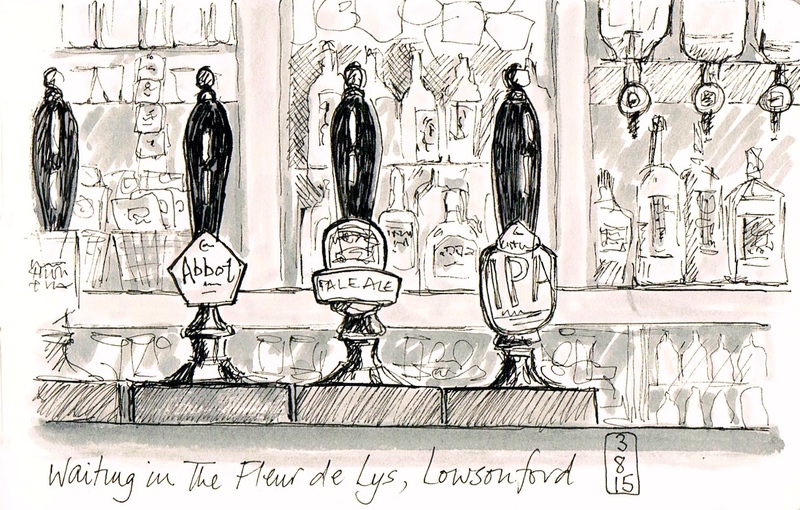 This entry was posted in Uncategorized and tagged challenge, Manchester USK, personal development, physical environment, psychotherapy, relationship to place, self awareness, sense of place, urban sketching on January 31, 2016 by Chris. Sketchers need to have their eyes open; the act of looking closely at the environment is fundamental. But we all see something different, have different styles, and draw a multiplicity of truths about the same street scene. The mantra of ‘draw what you see, not what you think you see’, has limited value, it seems to me, if it carries any implication that there is a correct version that we can all agree on. Of course it is vital to get beyond the assumptions that we ‘know’ what something looks like – but what emerges is never a ‘correct’ version but rather an unlimited number of unique drawings. All this has been illuminated by my reviewing ‘Walking Inside Out’ a wonderful book edited by Tina Richardson about contemporary British psychogeography. It’s a stimulating mixture of academic and literary contributions, all emphasising the impact of the physical environment on our identity. Where and how we live, our sense of place and belonging are all bound into our relationships with others, and make us who we are. We all have an internal psycho-social landscape. Psychogeography encourages us to look closely at what is around us, throw away the map and explore the marginal spaces, opening our eyes to the way in which we have become habituated to surveillance, social control, privatisation and consumerism. Along the way, it is witty, playful and somewhat anarchic – I thoroughly recommend it, especially to urban sketchers with social constructionist leanings. Psychogeographers are trying to capture the emotional resonances, the social history, the political forces that permeate the streets that they walk. Like urban sketchers, they are physically in the environment they are trying to understand, experience, and describe. It seems to me that there is an alliance here that could be very productive and creative – the urban sketcher- psychogeographer; the psychogeographical urban sketcher. Maybe I could join a group – or even start one up? 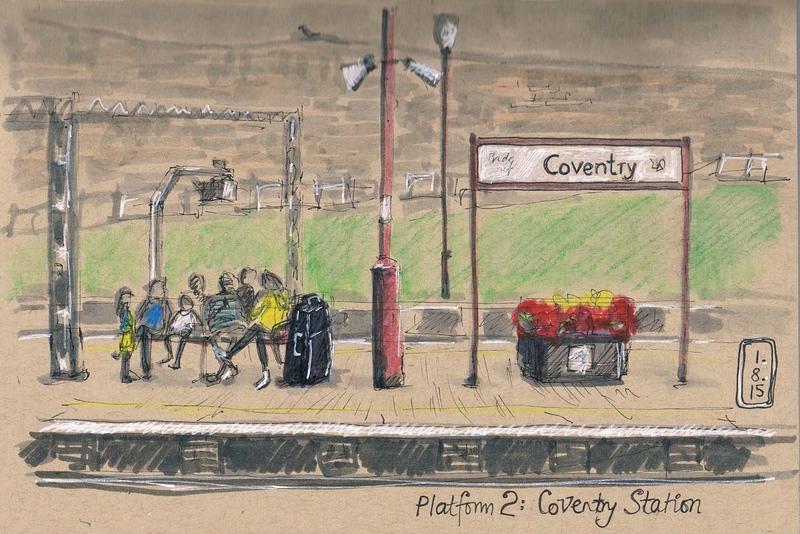 This entry was posted in Uncategorized and tagged consumerism, Coventry station, doodles, Earlsdon, emotional resonance, internal landscape, physical environment, privatisation, psychogeography, social constructionism, social control, social history, surveillance, Tina Richardson, urban sketching, Walking Inside Out on August 5, 2015 by Chris.